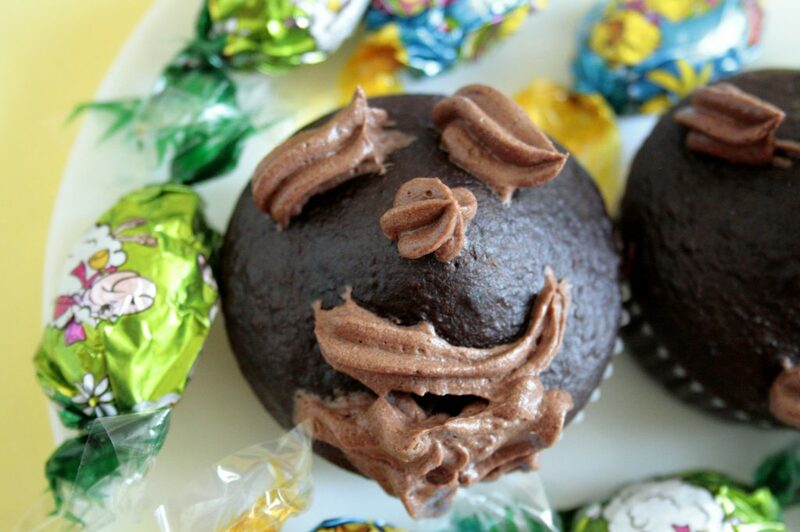 Those Low FODMAP Easter Chocolate Cupcakes are really a treat! With a chocolate frosting and a milk chocolate egg on top (optional), it is a great chocolate dessert, that you can make for your family and guests at home. With a simple frosting set of nozzle(s) and a piping bag, that you can buy cheap in a Pound shop, you will impress all of your guests! Because they are sweet, chocolatey and calorific (328 kcal per cupcake), I would recommend eating one as a portion. Also, after having this one cupcake you will probably not want to have anymore, because it will satisfy your chocolate cravings. Recipe adapted from Wife Mama Foodie website, with an author’s permission. In this recipe, I used a Choc Chic Raw Cacao Powder, provided by a FODMAP Food Co, The Low FODMAP Diet Store. They asked me to review this product. It is the first time that I ever used a cacao powder as opposite to cocoa powder. It is suppose to be more healthy and pure, because it made using raw pressed beans as opposite to roasted beans in cocoa powder. 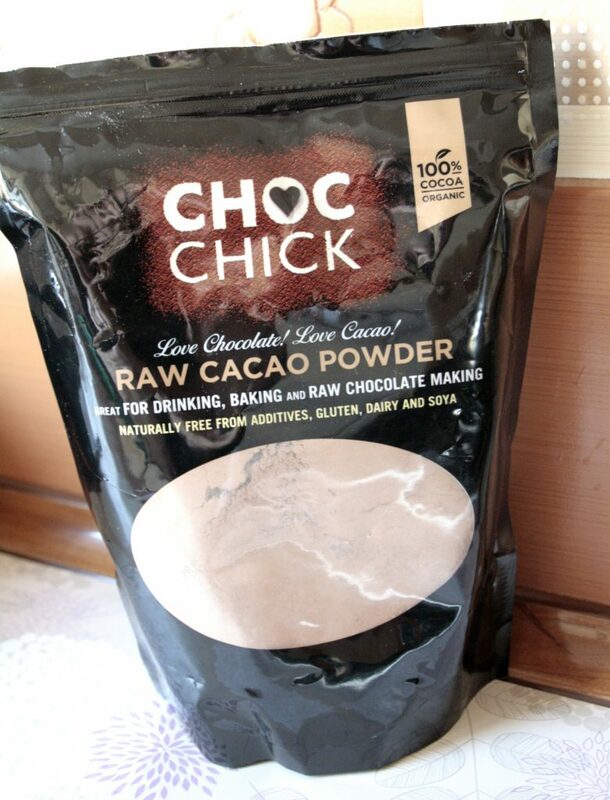 This raw cacao powder is lighter in colour and in my opinion has a stronger aroma from a cocoa powder. I used this Choc Chic Raw Cacao Powder with a very good effect in this recipe, both for the cupcakes batter and the chocolate frosting. 12 small chocolate eggs, to decorate (optional). can easily be turned into a vegan recipe – by replacing milk and butter with a plant versions and ommitting the milk chocolate egg on top. Preheat the oven to 180 degrees C. Line a muffin tray with 10-12 cupcake cases. First, mix all of the dry ingredients in a bowl: flour, sugar, cacao powder, baking powder and soda and salt. In a smaller mixing bowl, mix the wet ingredients: milk, coffee, oil and vanilla. Pour the wet ingredients into the dry ingredients and blend well. Divide the chocolate mixture between the 12 cases, filling to 3/4 of the cupcakes cases. If you fill to the end, the batter would overflow. Bake for 15- 20 minutes. It depends on your oven and fan ovens usually bake quicker. You can check if the cupcakes are cooked by pricking them with the skewer all the way to the bottom. If the skewer comes out clean, it is baked. Beat the softened butter until creamy. Add the cacao powder and start beating on a low speed. Keep adding the icing sugar, bit by bit, until all of the sugar is incorporated. Add the vanilla extract and some milk, if the buttercream is too thick. Frost cooled cupcakes as desired. I like a simple star or flower shaped nozzle, not too small. 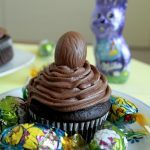 You can decorate the top of the cupcakes and place a small Easter milk chocolate egg on top. For a Polish version of this recipe, go to Przepisy Low FODMAP blog. 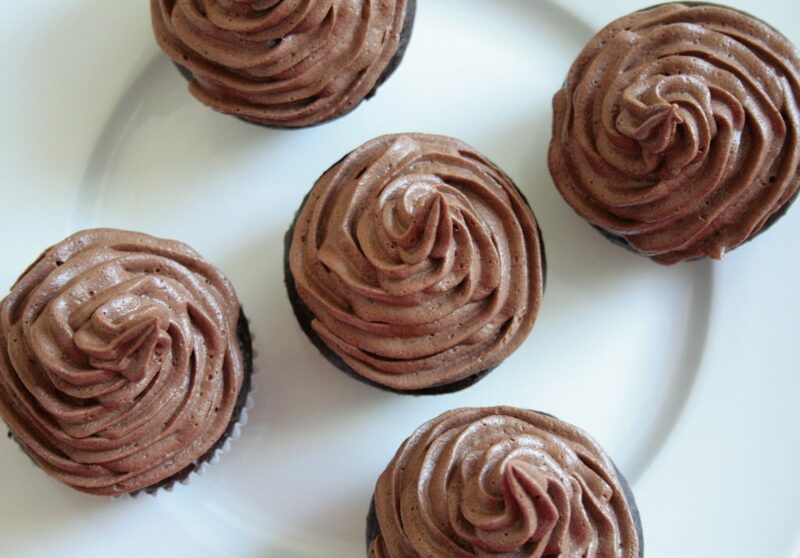 Chocolate frosting:Beat the softened butter until creamy. Add the cacao powder and start beating on a low speed. Keep adding the icing sugar, bit by bit, until all of the sugar is incorporated. Add the vanilla extract and some milk, if the buttercream is too thick. Frost cooled cupcakes as desired. I like a simple star or flower shaped nozzle, not too small. 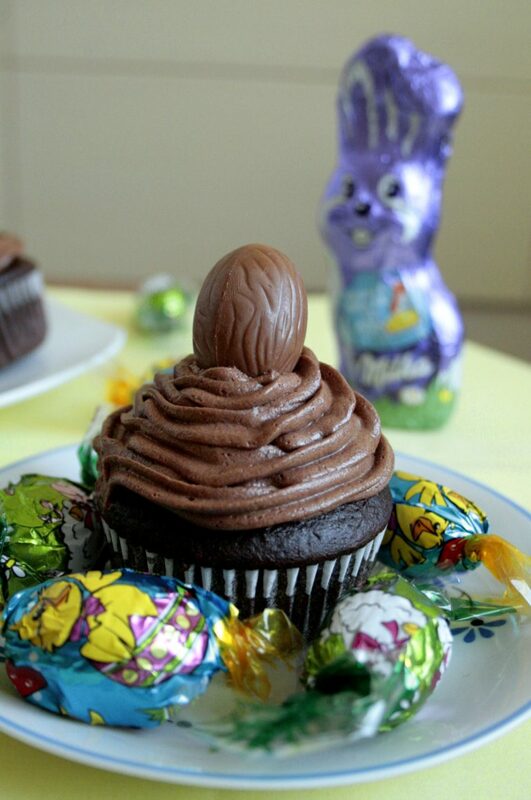 You can decorate the top of the cupcakes and place a small Easter milk chocolate egg on top.Enjoy! 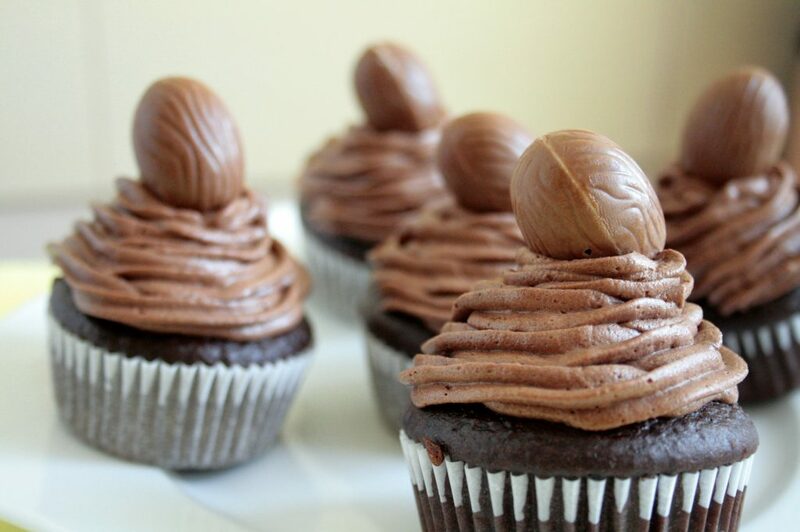 You can decorate the cupcakes with a 12 small chocolate eggs (optional). If you are looking for other ideas on Low FODMAP desserts, find them here.